Image: Girl blowing a bubble. Photo by AdinaVoicu / Pixabay. He may have one of the strangest names in Jewish history*, but Ben Bag Bag’s famous line is a favorite of mine. The “it” he refers to is the Torah. Read it over and over, he suggests, because there is always something new to find there. I was reminded anew of the wisdom of this line this past Shabbat. On Yom Kippur, I went to the emergency room with severe difficulty breathing, gasping and gasping like a fish out of water. Tests revealed that my breathing was impeded by a number of blood clots in my lungs. Thanks to the skill of the doctors and nurses, I am breathing better now and feeling better every day. My God, the breath You have given me is pure. You protect it within me. Source of all creation, Sovereign of all souls. In whose hand is every living breath and the breath of humankind. I have no guess as to how many thousands of times I have murmured that prayer, but it never before occurred to me that I was giving thanks for breath. 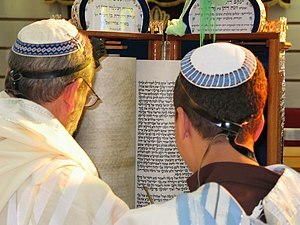 No matter how many times I say a prayer or read a line of Torah, I do not know when a new experience in my life will cause the words to light up with new meaning. Until last month, I did not fully appreciate the value of breath. I thought that “soul” was a more meaningful translation of neshamah. *Ben Bag Bag’s full name was likely Yochanan ben Bag Bag, and one tradition teaches that his name is an acronym for “ben ger” and “bat ger” suggesting that his parents were converts to Judaism. Another tradition teaches that he was himself a proselyte, the cheeky fellow who asked Hillel to teach him all of Torah while standing on one foot! Posted on October 18, 2015 December 1, 2016 Categories Jewish Prayer, Pirkei AvotTags Ben Bag Bag, neshamah6 Comments on Turn It Again, Ben!